Inauguration Day is this week, and NFCB convenes stations to talk responses. The 2016 Presidential election galvanized the nation in many ways. 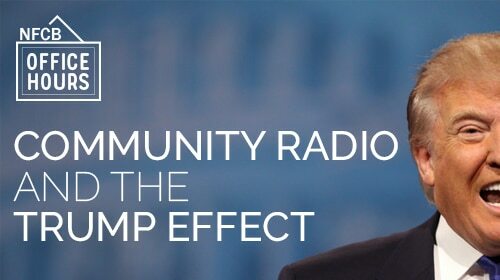 Chances are, your station is hearing from listeners and volunteers with a wide range of viewpoints about the outcome. NFCB is introducing a new service for member stations. Office Hours brings stations together to talk with colleagues about what you’re experiencing at your station, to hear how fellow leaders are addressing matters, and to share ideas to help your station. President-Elect Donald Trump prompts many discussions in our respective communities. How are you representing the diversity of opinions? Office Hours is a service available to member stations. Your station can join today.